I encountered Orbit Baby while at CA Boom V… this and the Nomad Yurt were the two things i walked away raving about. The Orbit Baby system is so modular that you have one main soft handled baby carrier (good for the day you leave the hospital), which docks into the easy car seat base as well as the quick collapsing stroller… and also with the simple eames rocker matching rocker base. And as your child grows, you can upgrade to the toddler stroller seat (still works with your stroller and car seat). And for those who like basinets, you can also go for the basinet option which also docks into all the bases, and even comes in a new organic super soft ‘green’ edition. I know it seems silly, that i’m raving about a kid system that i couldn’t possibly have any use for, but the thought that went into every design detail and the incredible quality of the whole system were irresistible in person. I also even attempted my first vimeo video below from the show (vimeo, wow, sidetrack, but i’m loving their incredible user experience). 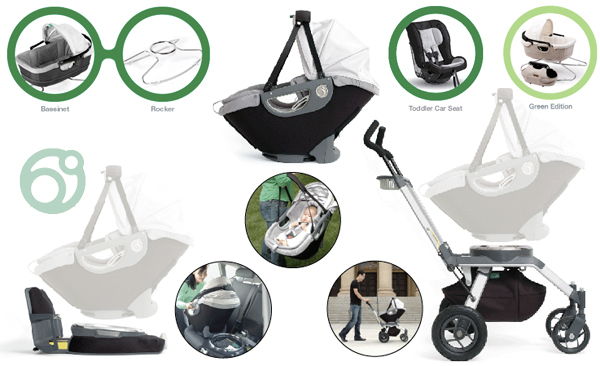 As for design details worth noting… this system even comes with an easy adorable bag that stores nicely under the stroller! It has two cup holders (aka perfect cellphone holder? )… and the handles even adjust/rotate to your comfort position. Coolest thing of all… (other than making life easier on the parents) - “zoo viewing mode” since you can rotate any of these seats on the base… you can have a sideways facing stroller, which seems perfect for walking around a zoo/aquarium, and perfect for not taking up the whole aisle in a crowded restaurant like many new parents seem to. Tons of pictures and a video after the jump! Candy and Nicho, are the Aussie duo that make up Noferin. Exciting news i recently received from them - they are coming out to Santa Monica (from Carrara Island, Australia!) for their solo exhibition at Copro Nason on April 5th! I’ve been begging them for a sneak peek at what is to come… and studio pics and perhaps some paintings in progress coming soon… so far i’ve got a sneak peek at the Pecanpals (which you may remember from .org #7556) - made up of Fanelli, Pecan, Pandacake, Claudius and Jac Jac (read their bios on the Noferin site). 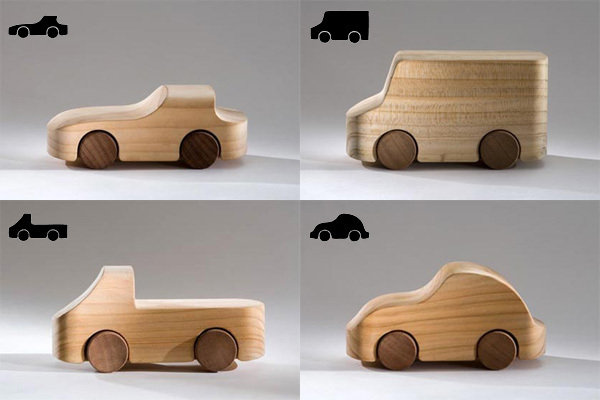 These little guys are entirely made from wood, hand crafted, hand painted, and limited to 200 per character! The final versions may vary slightly from these prototypes, but i hope not by much, since they are pretty perfect looking as they are! See closeups of the whole set after the jump! 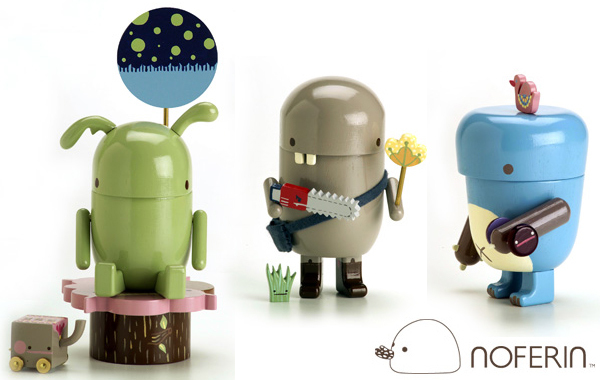 I love all the little sidekicks… the grass cuttings, elephant, and dumbells are definitely my favorites. 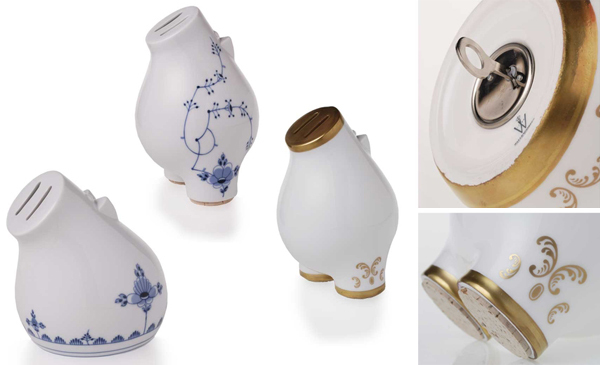 The German Theosaurus - the porcelain piggy bank with nostrils so large you’re sure it ought to be able to sniff out some truffles for you… or, at least, help you save up some coin to buy some! After CA Boom V (which took merely an hour to cover) ~ i headed over to Abbot Kinney and stopped in on Andy over at A+R, where he had just gotten the Theosauruses in, and he even has an exclusive on them this month! These adorable piggy banks showed up on .org as #7013, but seeing them in person, you can’t help but want to pick it up and bring it home… really, it’s one worth checking out in person, and would make a darling gift for nearly anyone, once you figure out which one to buy. We debated whether the sitting or standing was more cute… and personally, i think the sitting one is most adorable when next to the standing one, however if i only got to go home with one, definitely the standing one… in porcelain with the blue pattern! Although, the sitting one does have a locking bottom, versus the two cork feet of the standing one… and the family of the 4 did look most adorable together. Anyhow, take a look below to see how they look in context of the real world (versus the uber-clean product photography world). The Puppy now comes in a sky blue! 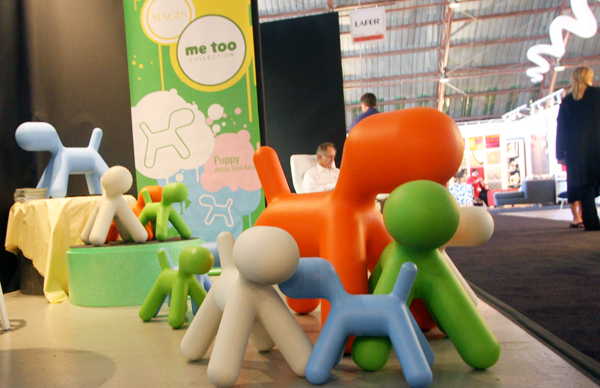 This was the first thing to grab me at CA Boom V at Santa Monica Airport’s Barker Hangar today… the Magis Me Too Collection’s booth is filled with all four sizes of the puppy in the four colors - green, white, orange, and now blue! 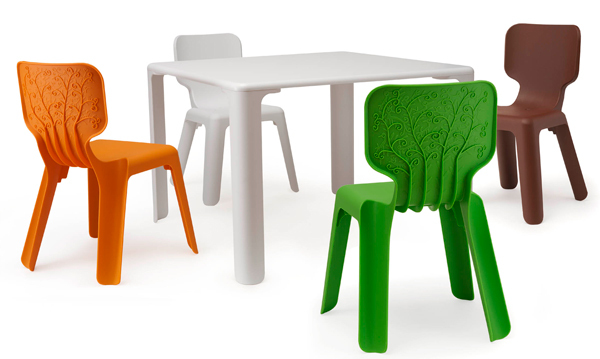 This piece by Eero Aarnio is quite the iconic and irresistible kids piece that i would love to have around… see more pics below! Mobius Climbers from Landscape Structures! Is there simpler more intriguing surface? My future backyard will definitely need one of these… essentially it is a giant sheet of annodized aluminum with rock climbing styled hand holds so kids (or you) can climb up, down, and all around any side (well, i guess its only really ONE side) of it… It is available in 4 configurations to accommodate various budgets ~ 3, 6, 7, and 12 panel options. My only disappointment with this is that you can’t climb a full loop and go around and around since the two ends go into the ground (so really this isn’t a mobius strip so much as a crazily bent sheet), but with a little imagination i supposed you can assume that where these go into the ground they pop out into another yard and continue the loop. Also cool could have been if it was in a loop AND you could unzip it down the middle for an even larger mobius strip! More images after the jump! Every feel like your brain is just hopping all over the place with ideas? 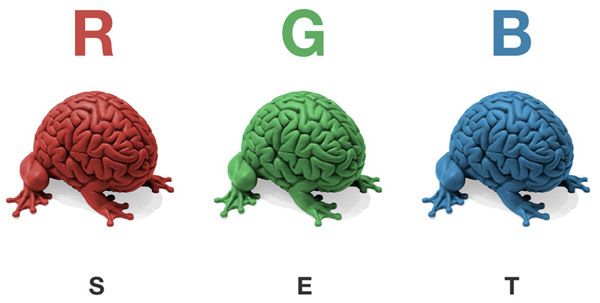 Combining my love of brains, frogs, and toys… check out Emilio Garcia’s Jumping Brain RGB set by Lapolab! And as you can see from the sneak peeks below from the thread on Solson Toys, the hemispheres even separate! I think i’d have to get the set and mix and match them all. What would i ever do without Vinyl Pulse? NOTCOT Note: I’m excited to introduce you to Jenny Lemieux and Leo Corrales, of HERO Design Lab! Old friends from my Milan grad school days, they were nice enough to show me Toronto, and we had so much fun all weekend, that they’ve even written some posts for you! Starting off check out this awesome behind the scenes look at Monster Factory (who has had much love across NOTCOT over the years)! We dropped by the Monster Factory factory today, as I’m dying to get my hands on one of their super cute little kid-friendly guys, and of course, we wanted a sneak peak at how the monsters come into being…. We chatted with partners Bliss Man and Rhya Tamasauskas (Adam Dunn wasn’t in) and some of their team. The coolest, gentlest people, I have to say, which only makes sense. 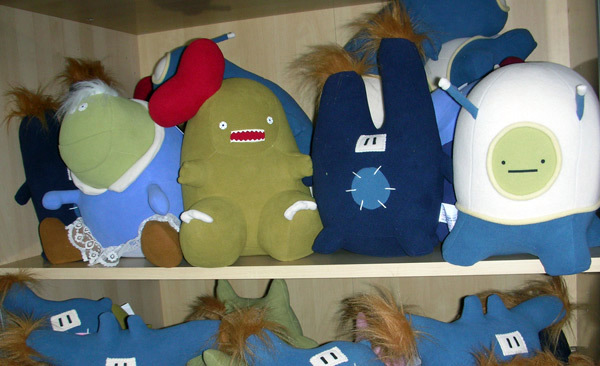 We got a behind the scenes glimpse of how they turn their concepts into patterns, then various prototypes, before stitching together the 65 kinds of monsters. We love that they do the whole thing in Toronto, and hire local fashion grads to lend a hand. See the many pictures after the jump! The King Of The Deadbeats - aka Rex beta vulgaris mortem by Joe Ledbetter is too awesome. That’s the blue walrus guy with a head on a stick. This is just one of the new 8 figure blind box series dropping from StrangeCo, and it’s their new multi-artist mini figure series, The Vivisect Playset, featuring Anthony Ausgang, Luke Chueh, Peter Gronquist, Thomas Han, Joe Ledbetter, Greg Simkins and Amanda Visell! Quite the lineup ~ Luke Chueh’s is perfection as well… that classic near tears look that lives beneath the glossy made up facade we parade around in - Mugs Bunny - aka Lepus polypersonas. For those in LA ~ the big Toy Release party (really its like a fun gallery opening where we can all afford to buy the goods) will be at Gallery 1988 on Jan 26th! See more pics of the full set packaging after the jump. I’ve always found the most intriguing puzzles to be those that look beautiful as objects and cause people to over think the solution. 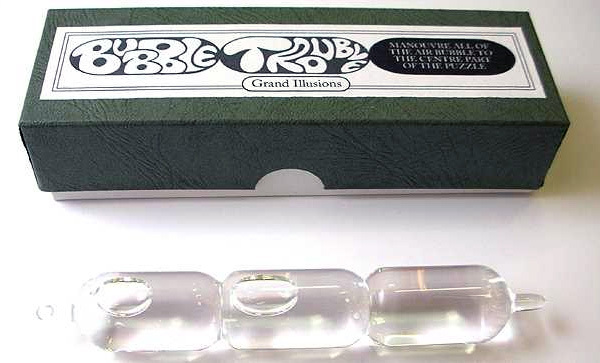 And this Bubble Trouble glass puzzle fits that perfectly. The goal is to move the single air bubble into the center chamber of this glass vial. It’s elegant in design and solution, and i love the typography on the packaging as well. Tempted to purchase this one to leave on my desk and watch people tilt it up and down and all around in hopes of achieving their goal. Ok, and if you simply can’t stand not knowing, solution is below. 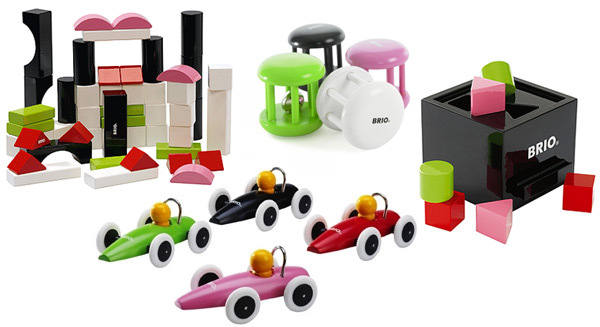 Q-BA-MAZE - you may have noticed this new designer twist on the old school 3d wooden marble mazes on the gift guide. Well i played with it a bit before then, but only had enough free time on my hands tonight to build more silliness with it and take a few quick pics… I must say there is something calmingly mesmerizing about playing with all the ball bearings ~ and the quality of the pieces are far nicer than i expected just looking at images ~ my only complaint would be that sometimes they dont hold together as well as i’d hope, and in building my silly nearly 5ft tall twisty single helix/staircase tower some of the core center pieces weren’t clicking together and it came tumbling down once… Also, some of the best packaging ever, i love that they managed to put the packaging together so that you can actually flip the box over to reset the balls to roll down the maze in the box! It’s fully functional to play with before it even gets opened! 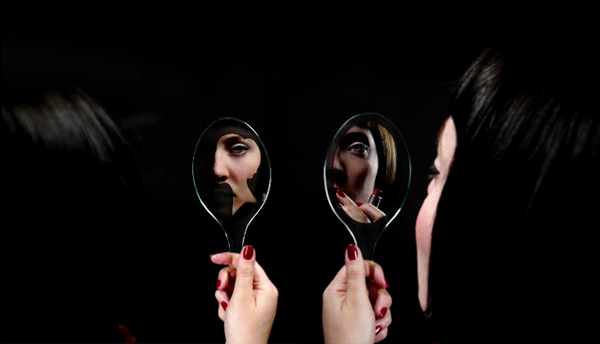 Anyhow, take a look at the huge images below, and to find out more, go watch the videos at Q-BA-MAZE!